Adding Jay D’s Louisiana Molasses Mustard to a classic butter sauce was an absolutely delicious idea! This sauce is tasty on anything and everything: vegetables, meats, seafood or your favorite dish. The fat from the butter is balanced well with the acidity from the Molasses Mustard. 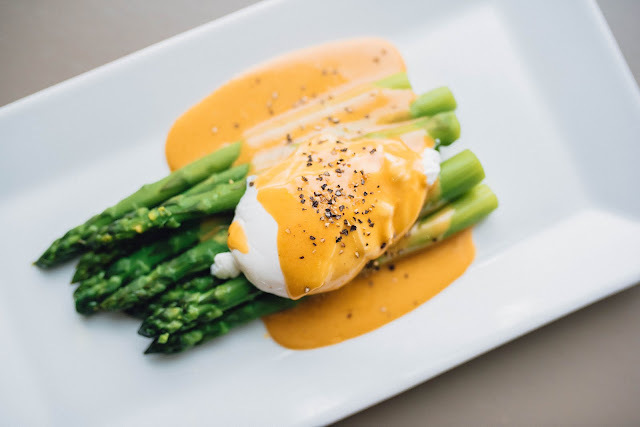 This hollandaise came out a rural, rusty-orange color and is an excellent contrast over bright green asparagus and a poached egg. In a saucepan, bring 2 quarts of water to a boil. In a stainless steel bowl, whisk egg yolks over hot the water bath. Using a small ladle, slowly pour a thin stream of butter into egg yolks while whisking continuously. Keep butter warm (not hot) during process. Add lemon juice after the third ladle of butter is whisked into egg yolks. After all butter is added, add Molasses Mustard, hot sauce and kosher salt to taste. Whisk until uniform color.